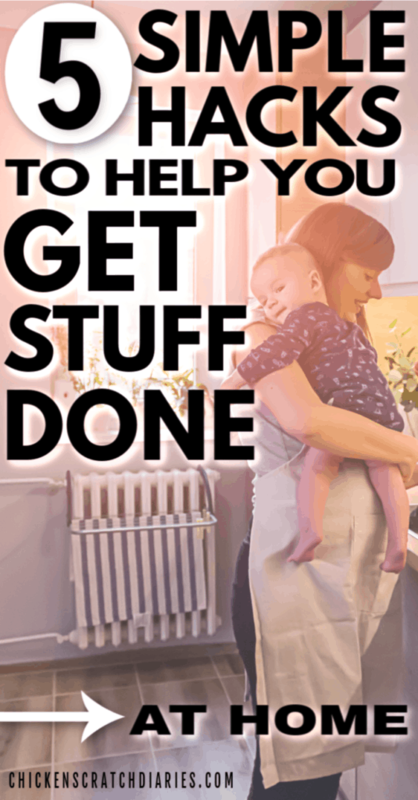 So you want to be more productive at home – but how do you get it all done? With kids, work, a household to manage – how does anything get accomplished at all? I get asked this question from time to time. And I really want to laugh! Because these are questions I often ask myself, and half the time I feel like I’m failing. I’ve discussed before that I believe there’s no such thing as the perfect balance. It just ain’t gonna happen, friends. But with a lot of responsibility on my plate, I have developed systems that do WORK for me and have taught me how be more productive at home, when I make sure to follow them. And while I’m still learning as I go just like every other mom, I thought I’d take time to share some of these tips. I didn’t have these systems in place for managing the housework, the household budget, grocery shopping, meal planning – just the basic stuff before I had kids. I had to learn it over time. And after kids – well, we all know those things just become that much more complicated – but SO NECESSARY. Truly, simple routines don’t just benefit kids – they benefit parents just as much! 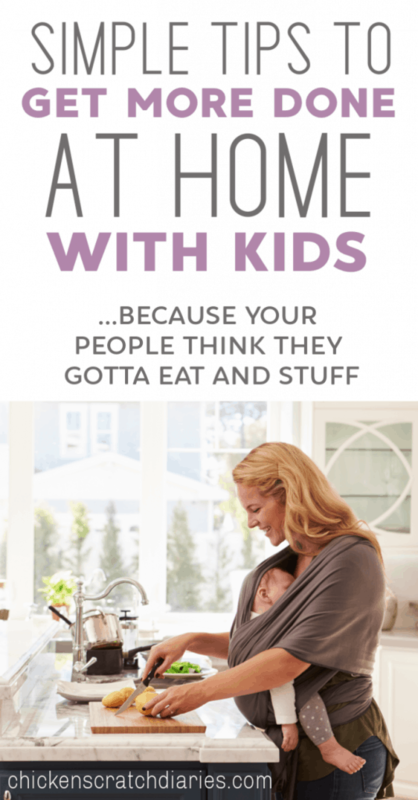 Four kids later, I have come to rely on these systems, routines and household management hacks that really do make my life easier- and allow me more time to spend with my family as well. Although I had grand plans to stash away freezer meals with each of my pregnancies, I never seemed to accomplish it. I used to assume that freezer cooking involved spending all weekend cooking ingredients that must cost hundreds of dollars only to end up with so-so meals my family still might hate (because they’re pretty opinionated!). I only recently started experimenting with freezer cooking, and let me just say: WOW. What an amazing time-saver and budget-saver. It only takes me 1 hour to prepare about 8 meals. All the vegetable chopping & prepping is done in that one hour which saves me loads of time chopping & cleaning the kitchen throughout the week. When you double the recipes you can buy the ingredients in bulk and stretch your savings further. My favorites are the crockpot freezer meals. All I have to remember is to put the freezer bags in the fridge to thaw overnight, dump them in the crockpot in the morning and voila! Dinner is ready a few hours later. If you’re looking for a great resource for freezer recipes, I also highly recommend this freezer e-cookbook. Delicious, healthy meals with real, filling ingredients. You can download it directly to your phone or tablet. Freezer cooking has been such a life-saver on nights we would have otherwise ordered pizza (again) or eaten at 9:00 pm. Because sometimes there is just too much going on in our lives to cook a balanced meal every single weeknight. Anyone else relate?? Pre-kids, I could easily do a two-hour “cleaning day” on Saturday mornings and my house would stay pretty tidy all week. Now, umm….let’s just say I don’t have two hours to do anything and it would be undone in about three minutes if I did. Genius, right? I picked up this idea from a friend. My two littlest take a bath together and since I can’t really clean the bathroom (well) when they’re running around, this is a great time to clean while I let the kids play for a few minutes. I use natural household cleaning products so I don’t have to worry about fumes. And if I do this just two nights a week, that’s usually sufficient (even with the ongoing mess of potty training!). I aim to put in a load every morning after breakfast, right before lunch, right before dinner, and sometimes right before bed if needed. (4 kids = lots of laundry). Scheduling around our meal times makes it easier to remember and 3-4 loads per day keeps us fairly caught up, if there’s such a thing! We don’t have a hamper in the kids’ bathroom – it’s their job to carry their laundry and towels to the laundry room every night after their bath. One less hamper to drag across the house is a win for me! I’ve also opted to declutter more often and purposely keep the toy bins and baskets to a minimum. The more bins, the more stuff you’ll keep – and have to pick up. This might sound silly, but you can set recurring reminders on your phone’s calendar for tasks like washing sheets, shampooing the carpets – anything that you want to remember. Those more infrequent chores are easy for me to let slide, so I take full advantage of the calendar notifications! This might mean lowering your standards a little, because kids aren’t going to complete chores exactly how you like them to be done. But kids have to learn how to help out anyhow, and as long as they’re putting in effort, it’s worth it! My older kids fold almost all the laundry and help unload & load dishes. They also are great to help with the younger kids by helping find their socks & shoes & loading bags into the car so we can make it on time to school in the morning. If you have a baby or toddler, babywearing is a great way to do basic household chores and “involve” them as well! Tip #4: Get (more) Organized! In this post, I discuss the systems I have in place for simplifying our family’s day to day lives. Even though I consider myself a pretty organized person, I’ve come to realize that four kids later, I’ve slacked off quite a bit in some areas of my home! I actually took this FREE organization course recently to help me tackle some areas in my home that needed to be addressed and, in turn, lower my stress levels. I was surprised to find that organized-me definitely had a thing or two to learn! I’ll take all the pointers I can get. Tip #5: Accept help when it’s available and/OR keep it very simple. Speaking of help: I don’t know your personal situation of course, but IF you can afford a housekeeper even once a month (or every other month), it is worth every penny. I’ve only had this type of help a few times so far. But this is a definitely a goal of mine, to be able to hire housekeeping more frequently, especially for deep-cleaning tasks that I’m always behind on. 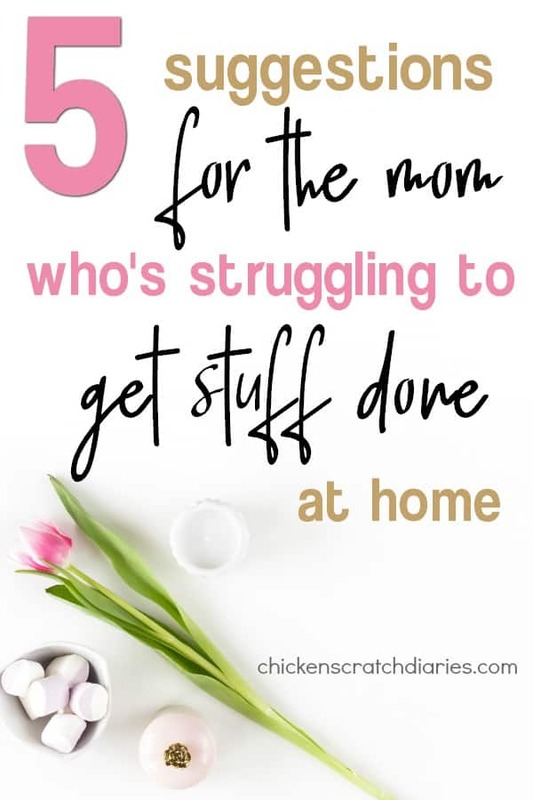 Again, I have four kids, two jobs (even though I mostly work at home) and we’re a busy family, so that help might be more necessary and practical for some than for others. However, I do remember those overwhelming feelings even with my first baby! Another option is to hire a sitter – even four hours a month is great for me to catch up on those deep-cleaning tasks or other projects that are just hard to accomplish with little ones at home. Depending on babysitting rates in your area, this might be less expensive than hiring someone to clean for you. When Productivity Doesn’t Seem Possible! To my mom-friends who live far away from family and simply don’t have much help available (OR single moms), I salute you. You are truly on call 24/7. My advice – which would apply to anyone – would be to try to keep your routines (and possessions) minimal and simple. The less stuff you have, the less activities on everyone’s calendar means more time you can spend doing things you love instead of managing schedules and the things you own. This is something I’ve been fighting for in our family especially in the last two years — less toys, less clothes, less involvement in every activity on the planet so that we can really have down-time to just enjoy each other’s company. The less decisions you have to make, the less stressed you will feel. You just do the NEXT thing. So even though we can’t do it ALL, I hope these tips will at least help you to accomplish those things you deem really important (or necessary) and allow you more time to spend with your family. Who knows, you may even get to relax once in a while! Thank you so much for taking the time to write this blog post. I am a new mom, and I really appreciate your practical advice! Hi Christina — Congrats on the new baby! I’m glad you found some helpful info here. Thanks so much for stopping by! Clean the bathroom while the kids are in the tub! How did I not think of that before? Genius. Thank you! I will definitely be implementing these tips! I especially love your advice to try freezer cooking. At the end of a long day it’s so hard to find the motivation to make dinner from scratch. It would be so nice to just heat up a pre-made meal. Great advice! Freezer cooking is a life saver for sure! I’ve only started it recently but I wish I had learned it BEFORE baby #4 came. Best of luck! Great tips to increase productivity. Thanks for sharing. I cannot even begin to say how wonderful and helpful these tips are! I am about to be a mom to 3(11 days from delivery date) routine, cleaning schedule, laundry schedule, freezer meals!! 🙌🏻🙌🏻🙌🏻 So helpful to any mom!